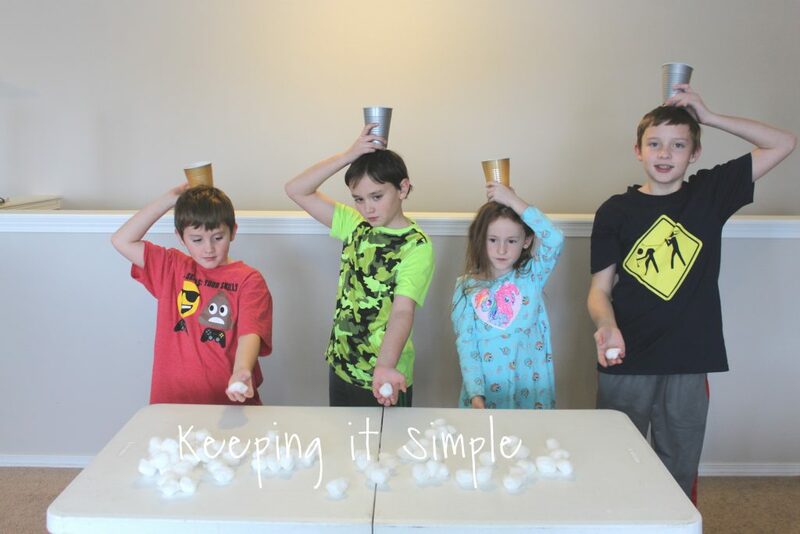 If you are having a party or a get together anytime soon, then you HAVE TO do these awesome Minute to Win It games using plastic cups, they are super fun and they are great for kids or for adults! 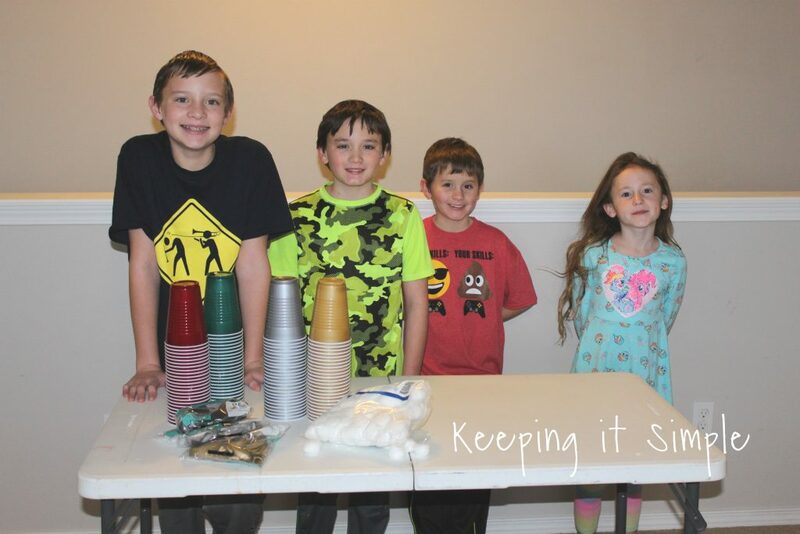 They are great for a big group or for a small group, either way they are a blast! 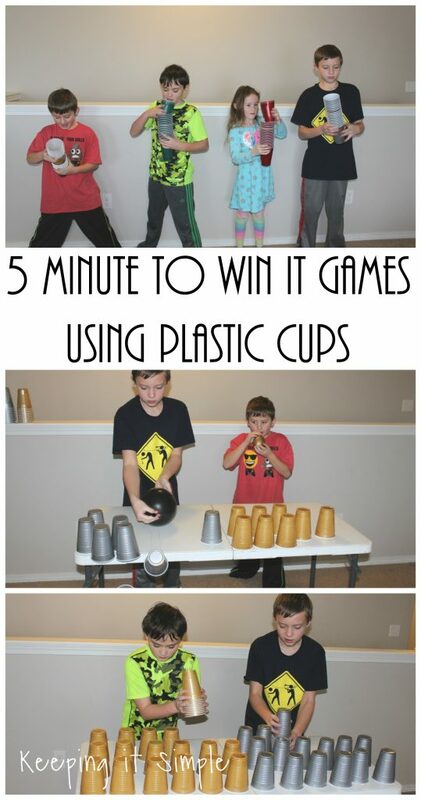 I am going to share 5 different games that you can play using plastic cups. 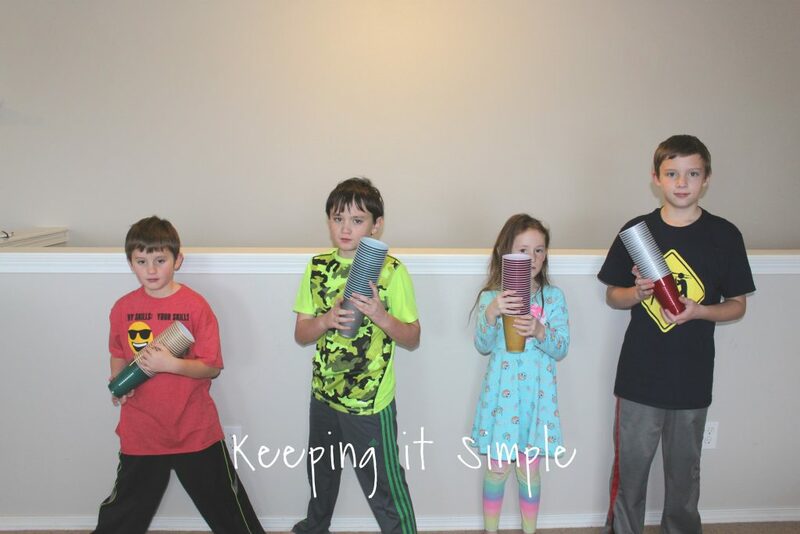 I had my kids test them out to show you that kids can do play them but with a lot of them being a race against someone or the clock, adults will love it too! Because I think all of us like some fun competition. My kids range from 12 years old to 7 years old. Here is a quick video to show you how these games are played and to show how fun they are!! My kids had a blast! 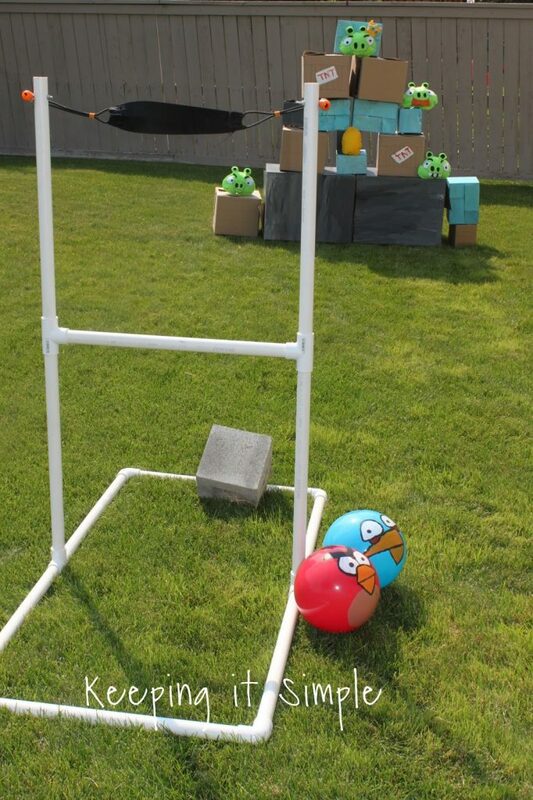 For the first game you will need the cups and balloons. You can have people race against each other or against the clock (30 seconds would be a good time). 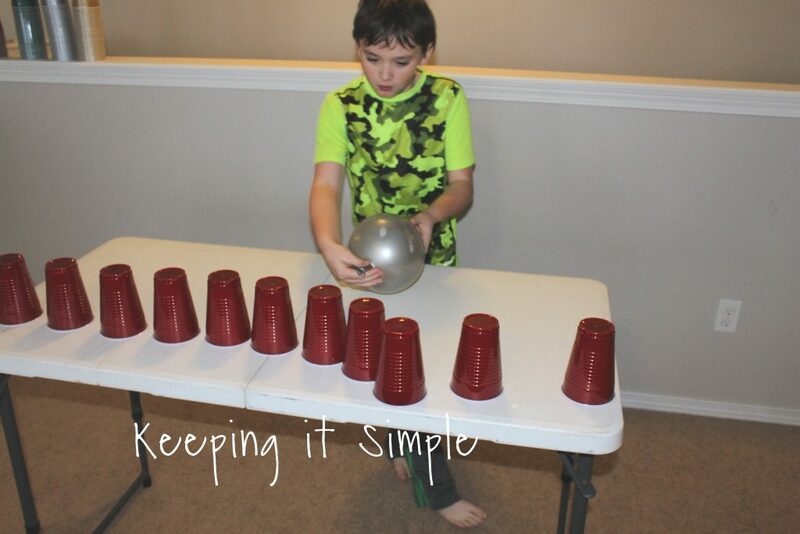 You place the cups onto the table and then the person has to use the air in the balloon to knock the cups off the table. We did two different rows because we had a small table but if you have a long table you can just do one row. 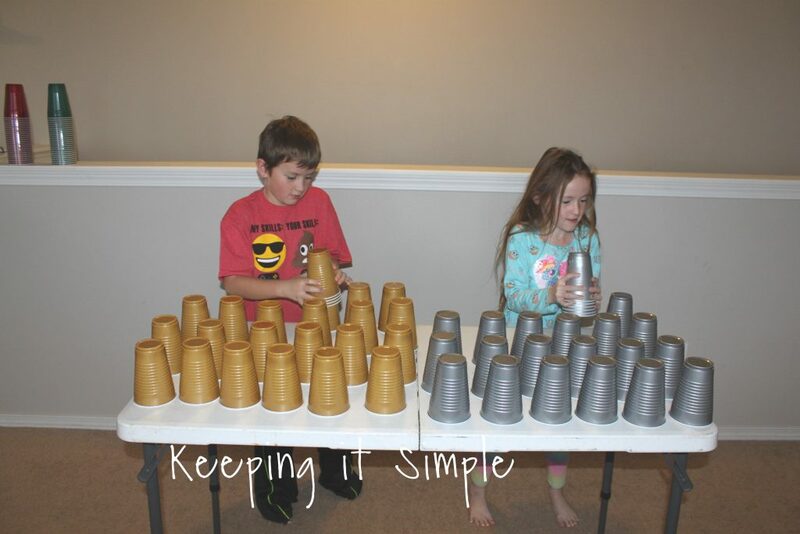 The goal is to get all of the cups off the table before the other person (or before the clock runs out). If you have a big group with lots of people, you could do a relay race and have each time have 2-3 people do it. 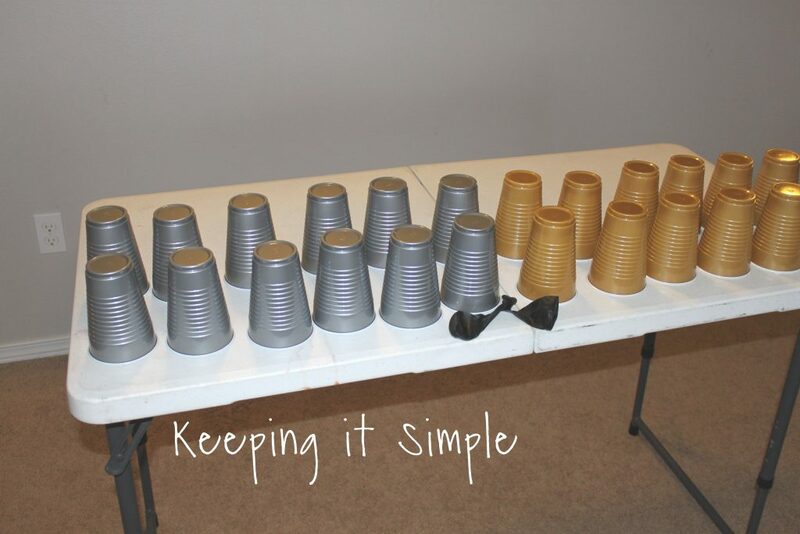 You have one person go, blow off all of the cups and then the rest of the team set them up again for the next person and do that until every on the team has done it. 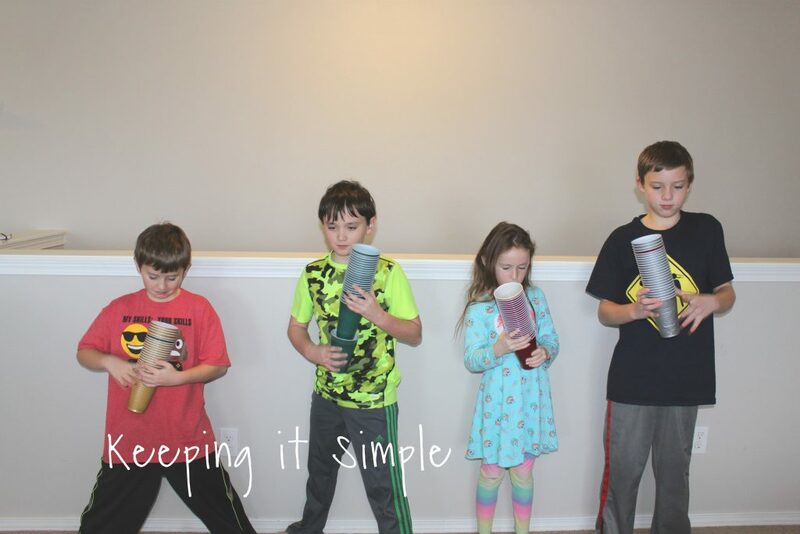 Here are some pictures of the kids doing it. 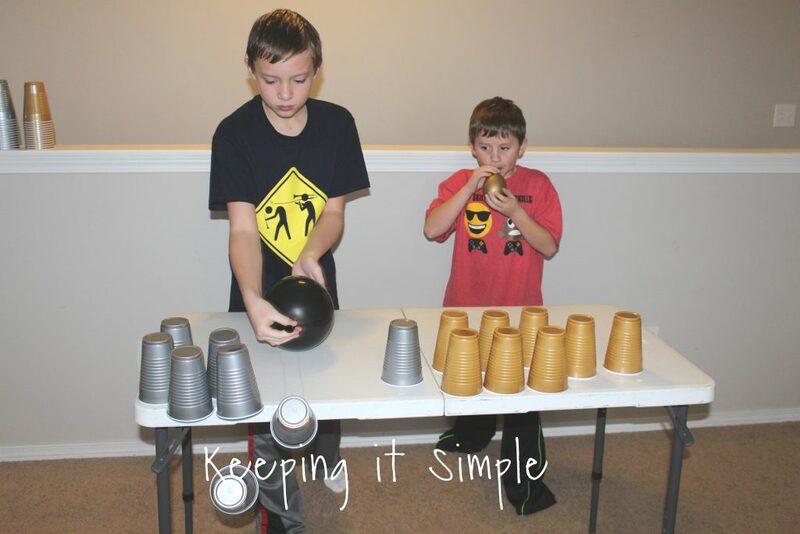 As you can see, they blow up the balloon and then use the air to blow off the cups. Here are the cups in just one row (which seems to be harder). If you want to make it really hard, you can place the cups in the middle of the table so they have to go further. Now for the next game. 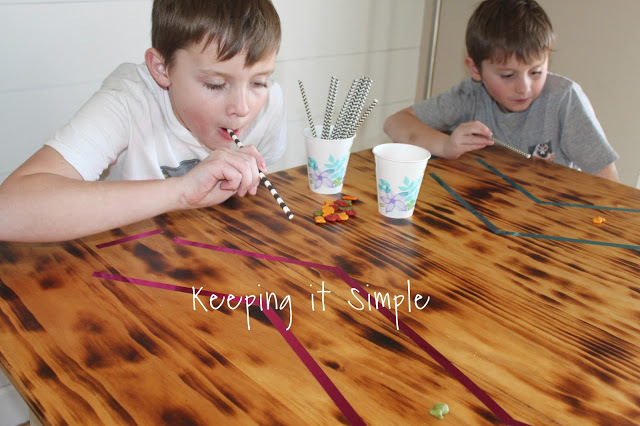 For this one we used 25 cups of each color and then placed them onto the table (24 are on the table, 4 rows of 6 cups and 1 to start with). 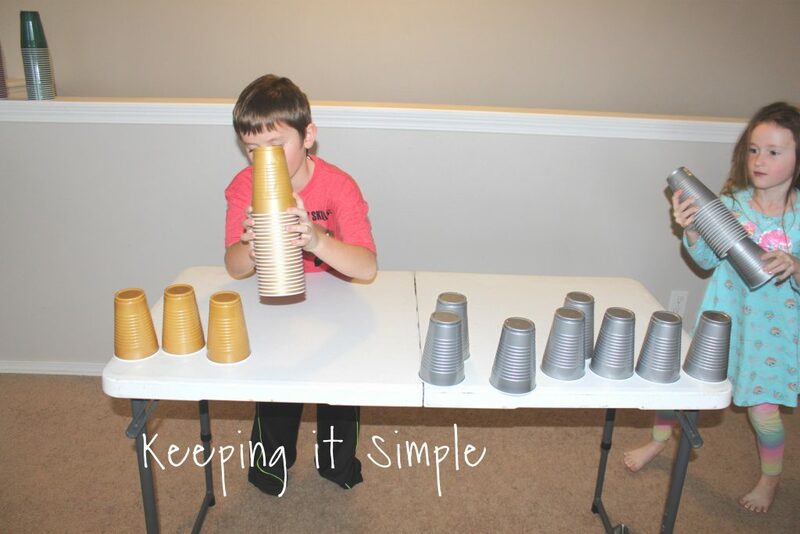 The player races against the other player by stacking all of the cups together starting with one cup and putting it onto the other cups. You can make the rules using only one hand or two hands. First person to get all of the cups stacked, wins. Here are my kids playing this game, I let them use both hands, with adults I would do just let them use one hand. Here is what it looks like when they are about to end. Now for the next game. This one is a classic but it super fun and hard! 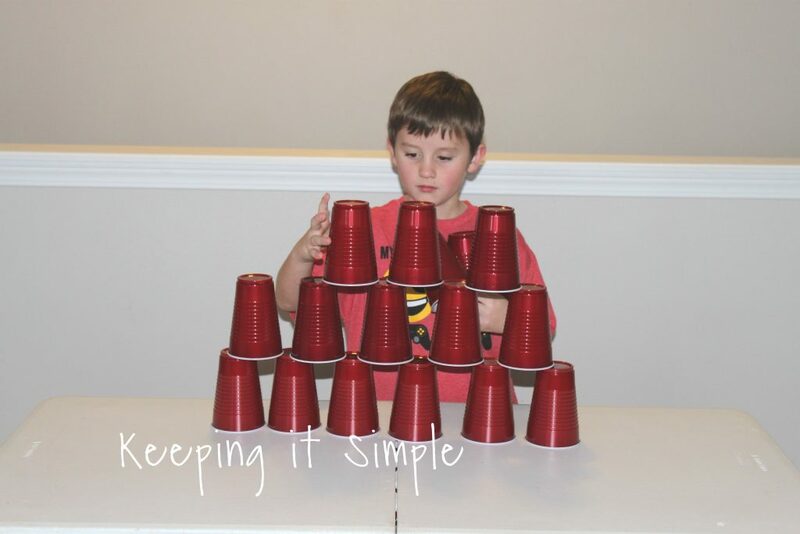 Making a pyramid with the cups. For this one I had the base be 6 and then the next rows were 5, 4, 3, 2 and 1, so we used 21 cups for this. You can have people race against each other or race against the clock or you can time people and see who can do it the fastest. 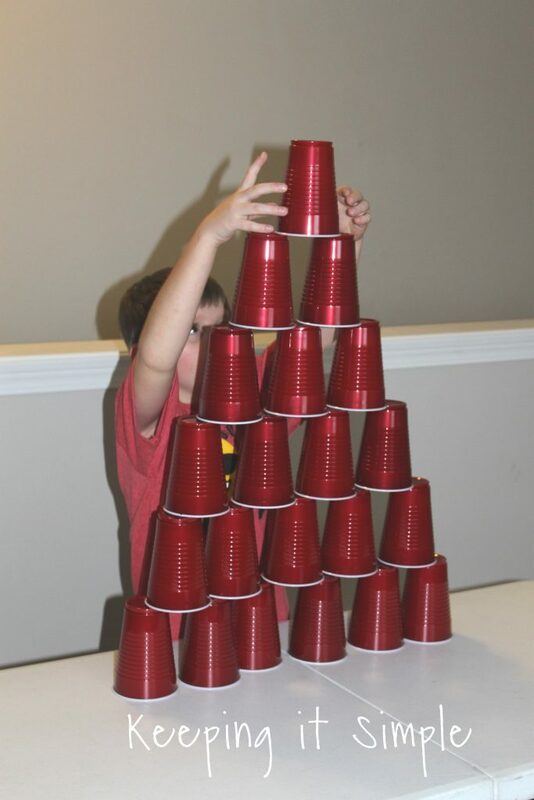 The goal is to stack the cups into a pyramid and then take down the pyramid as fast as possible. Here is my son doing it. You have to let the top cup be on there for a second before you start taking it down. Here he is taking down the cups. Now for the next game. This one is super fun and is great because lots of people can play at once. 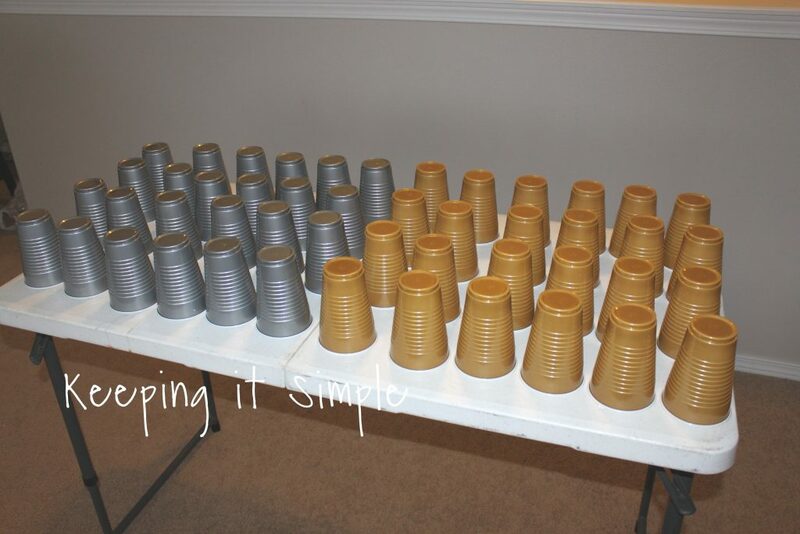 This one you have the stack of cups (25 cups) but you have one cup that is a different color. 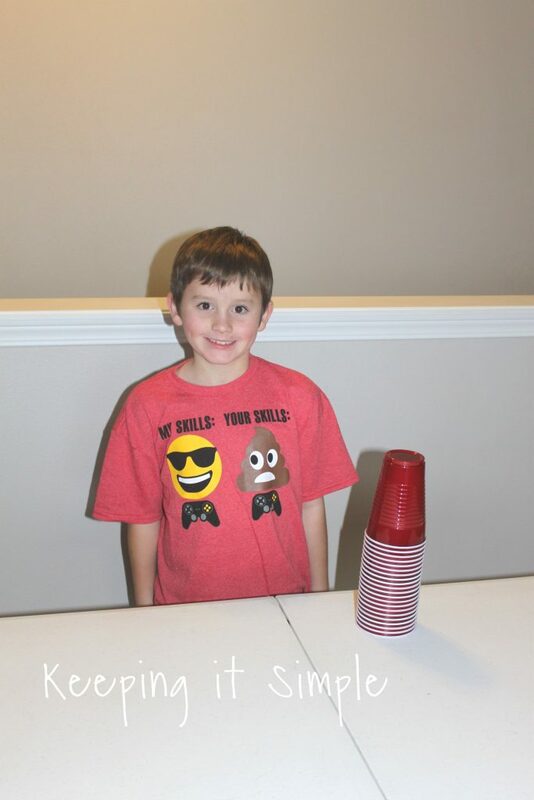 So everyone had 25 cups but I just had each one have a different color (so the red cups had one gold cup, the green cups had one silver cup and so forth). 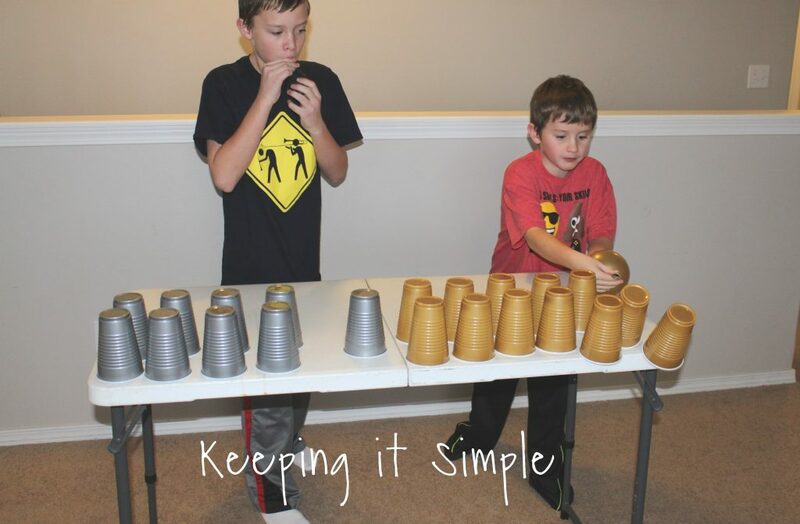 The goal of this game is to place the bottom cup into the top and work your way through the cups until the special colored cup is at the bottom again. 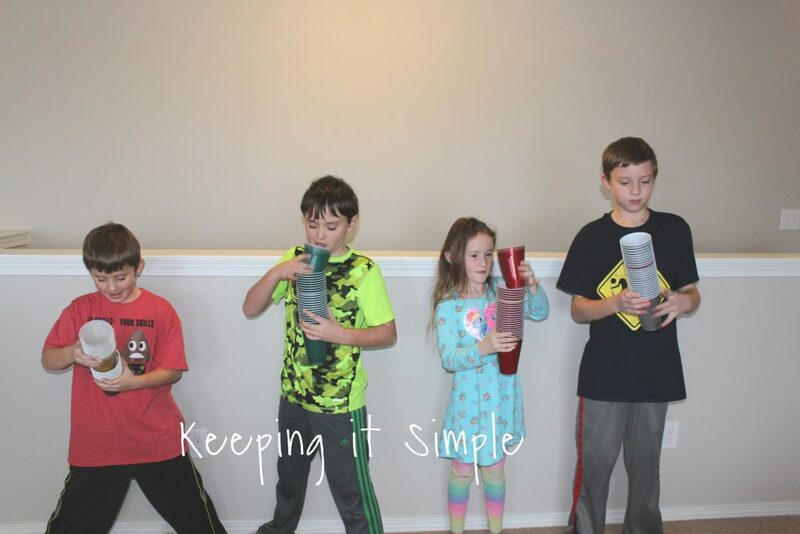 You can only move one cup at a time. Here are my kids doing this one, they had fun with this one. The hardest part was not dropping the cups. And now for the last game. This one is a blast to watch and play. For this one you need cotton balls and cups. 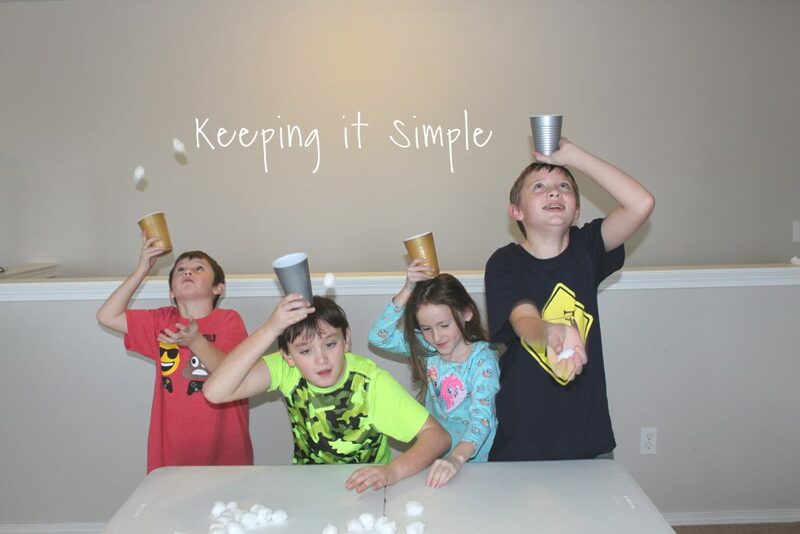 Every takes a cup and put it on their head and then you throw up the cotton balls and try to catch it with the cup. First person to get the most in a minute wins. You can only do one cotton ball at a time and you have to leave the cup on your head. Here are my kids in action, this shot cracks me up!! And yes my son on the left is not doing what he is supposed to be doing! And that’s it for the Minute to Win It games! 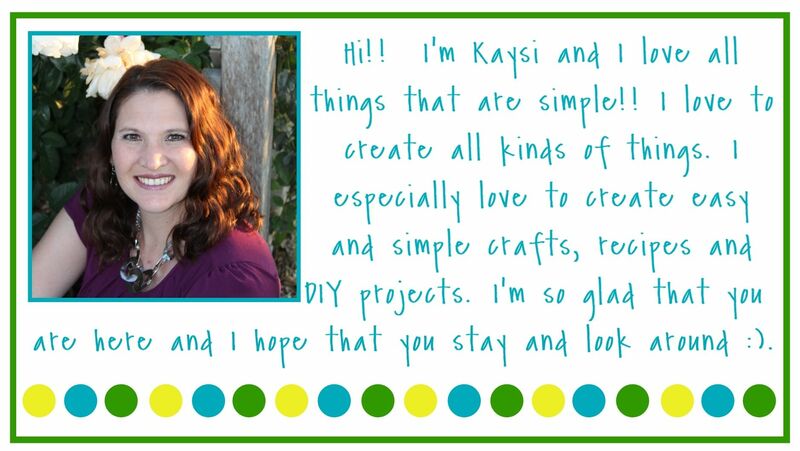 They are a BLAST and super easy to do. You can play one or all of them! 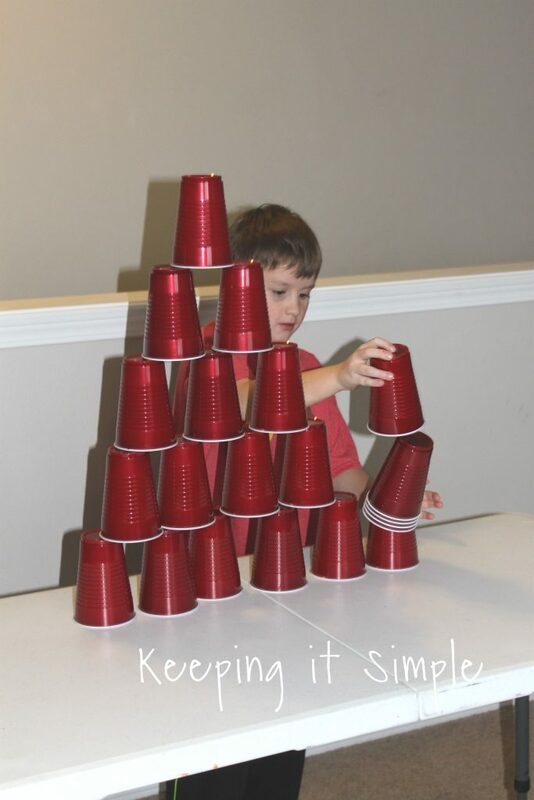 Here are some more fun games to do with kids!